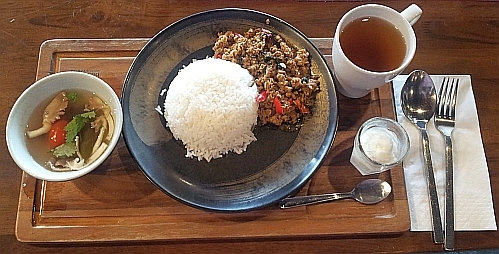 Rice with Thai Basil Chicken - MYR 18.40 nett. 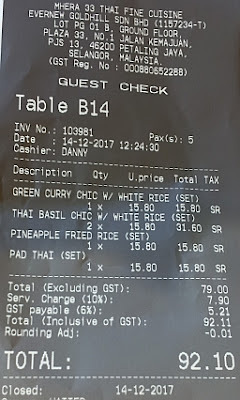 All the set lunch here costs MYR 15.80++ each (10% service charge and 6% GST = MYR 18.40 nett) and consists of a cup of hot or cold lemon grass or pandan drink, a bowl of tom yum soup, a very small glass of creamy coconut ice cream which is served together with the main dish. 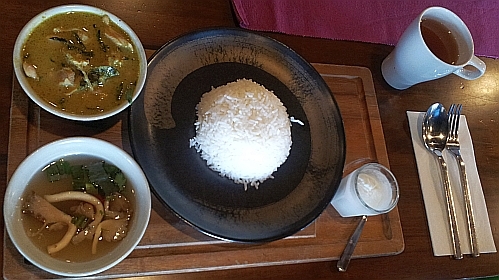 Green curry chicken with Rice set. Pad Thai. The menu did not state that this is a vegetarian meal but there is no meat, no prawns, no seafood inside this plate of noodles with loads of vegetables: chives, beansprout, carrots, broccoli and cauliflower. 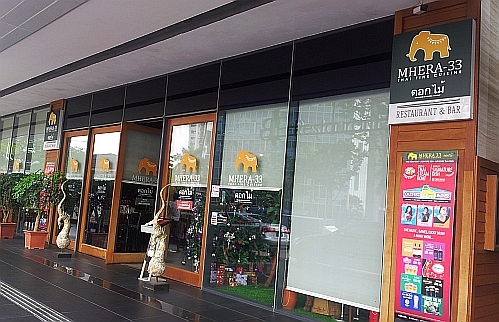 We do enjoy the pad Thai at our favourite Thai restaurant here. Their basil chicken is good too. Love the decor at the entrance. 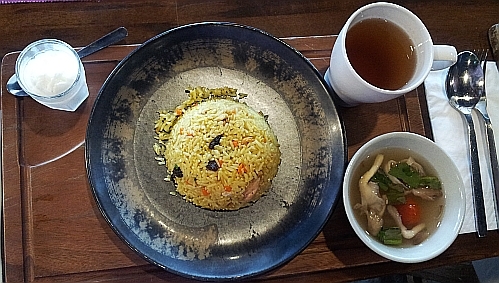 I tend to think most food can't go wrong in restaurants serving Thai cuisine. The food reminded me of my recent holiday. Lol. I prefer prawns, beef or pork pad thai. And lots of peanuts too. Hehe. I wonder did they forgot to put the meat or was it really a vegetarian pad thai! LOLx! Never thought of asking, hahaha! Hey give me my prawns... haha. 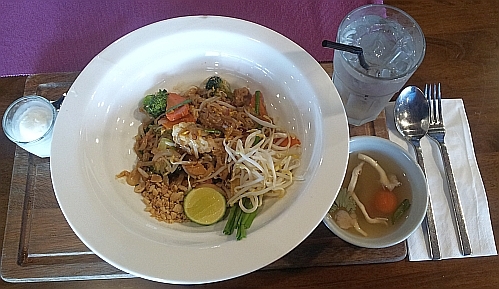 My usual place for Pad Thai is Black Canyon (which services it with prawns). Black Canyon looks like a pub to me so I never ate there. 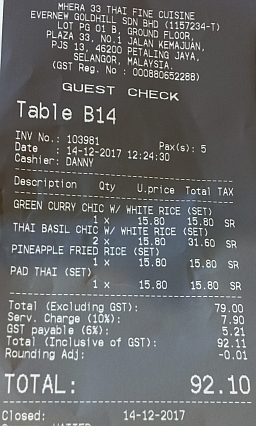 Didn't know it serves Thai cuisine. It's from Thailand I believe. The coffees are good and there are lots of menu items. There is one in Tropicana City Mall I think. My girl loves Pad Thai.. for me, a bit too sweet for me... I like pineapple rice though.. This one is balanced between sweet and savoury unlike the usual one which is more to the sweet side. The menu do look good! Set menu is quite good. I like their wooden trays! So unique and nice. I am curious how the Pad Thai tasted in vegan styled. Taste the same except no meat but all vege. Everything looks good. I will have a hard time choosing which to order. Curry is a safe choice.